grass(Sabzeh) that bald! But I still love it! 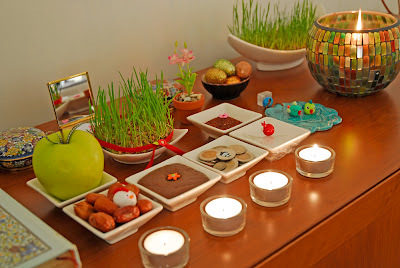 of Nowruz, the traditional Iranian new year. with the letter S or Sîn (س in the Persian alphabet). I wish you a lovely spring! سالی پر از برکت و شادی و سلامتی در پناه خدا آرزو میکنم! Oh Afi, i lovee your settings! Thank you for sharing! Have a lovely merry happy weekend and lots of love to you and yours! thank you for stopping by my blog and for your input / comment! i really appreciate it :) i love your etsy shop and your blog! It looks lovely! Happy New Year and Happy Spring! P.S. I've subscribed your blog posts, but somehow I don't get any updates on my reader (hmm.. have I told you about this once before? *scratching head*). 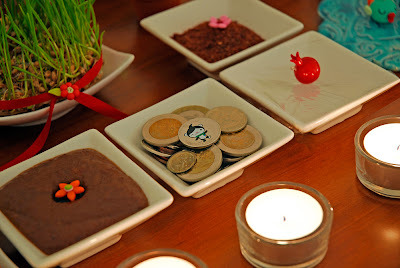 I love how you incorporated your little creations in your haftsin table! What a beautiful tradition. Thank you for sharing it with us.